Although the industry belief is that Carlos Beltran will sign with the Yankees, the Royals are interested in signing the outfielder. Bob Dutton of the Kansas City Star tweeted this, "OF Carlos Beltran appears to top Royals' revised offseason wish list." Dutton, in a second tweet, said that it is a long shot that Beltran signs with Kansas City, but the interest is real. Beltran, 37 in April, hit .296/.339/.491 in 145 games with St. Louis in 2013. Free agent pitcher Bronson Arroyo will be meeting with the New York Mets general manager Sandy Alderson within the next few days, according to Chris Cotillo of MLB Daily Dish. He's drawn the most interest from the Twins and Mets, while the Angels and Yankees could possibly be in play. Arroyo will be 37 in 2014. He went 14-12 with a 3.79 ERA and a 1.15 WHIP in 32 starts with the Cincinnati Reds in 2013. The Mets also took a look at free agent SS Rafael Furcal. But, their interest never picked up due to injury concerns. The Red Sox, Marlins, Nationals, Rockies, and Pirates have shown interest as well, according to Enrique Rojas of ESPN Deportes (hat tip to Robert Murray of Sports Injury Alert). The Rays have signed Juan Carlos Oviedo to a one-year Major League contract, according to reports. Formerly known as Leo Nunez, Oviedo has not pitched in the Major Leagues since 2011 (1-4, 4.06 ERA, 36 Saves). In 2013, Oviedo spent the entire season rehabbing from Tommy John surgery. Relief pitcher Edward Mujica has drawn interest from multiple teams, the Phillies, Cubs, Orioles, and Indians included. The former Cardinals closer is expected to receive a deal similar to the deal given to Angels Joe Smith, who signed a 3-year, $16 million contract. Expect Mujica to make a decision within the next few days. He went 2-1 with a 2.78 ERA in 65 games in 2013. He also added 37 saves. Buster Olney of ESPN believes that the Mariners will sign Ubaldo Jimenez, Ervin Santana, or Matt Garza to bolster their pitching staff. In order to acquire Jeff Samardzija, the Diamondbacks would have to include another team, according to Tom Loxas of Chicago Now (another hat tip to Robert Murray). The Blue Jays and Nationals are the other two teams that have shown a lot of interest in the pitcher. Hanley Ramirez told ESPN Deportes that he's negotiating an extension with Dodgers. "Step by step" was the term he used to describe the negotiations. The Rockies top free agent target this winter is first baseman Justin Morneau, reports Troy Renck of the Denver Post. They hope to get a deal done before the winter meetings. Morneau hit .259/.323/.411 in 152 games with the Twins and Pirates in 2013. 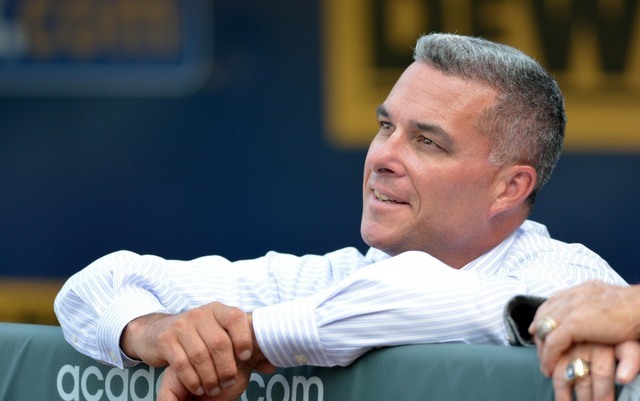 The Kansas City Royals have extended GM Dayton Moore's contract through the 2016 season, according to reports. He will get just a few more opportunities to finally turn the Royals into a playoff team. Since taking over as GM on June 8, 2006, Moore has improved the Royals record by 24 games since the 2006 season. In 2013, his hard work payed off, as the Royals went 86-76, their first winning season since 2003. He still hopes to reach the playoffs with Kansas City, something that hasn't been done since 1985, when George Brett was still their slugging third baseman. They won the World Series in 1985. Moore has developed young talent in the Royals system. Non-pitchers were an average of 26.9 years of age, while pitchers were 29.6 years of age. He definitely took a young team, and made them winners, as the Royals finished third in AL Central. Moore values pitching; the Royals had a 3.45 ERA in 2013, ranking first in the American League. The team's offense, however, seems to be their main focus this offseason. The .694 OPS that the Royals posted in 2013 ranked 11th in the American League. With a little more balance in this team, the Royals could reach the playoffs once again. And, they owe it to their GM, Dayton Moore. The San Francisco Giants and starting pitcher Ryan Vogelsong have agreed to a one-year, $6.5 million plus deal, according to Jon Heyman of CBSSports.com. The deal could be worth north of $6.5 million due to incentives, according to reports. Vogelsong, 36, has a career 4.52 ERA over his nine year big league career. In 2013, Vogelsong went 4-6 with a 5.73 ERA and a 1.56 WHIP in 19 starts. He was limited in 2013 after spending time on DL with a broken finger. Upon returning, Vogelsong posted a 2-2 record with a very respectful 4.55 ERA. Before that, Vogelsong went 2-4 with an ugly 7.19 ERA. Hitters hit .318 against him before the injury. The Giants went 9-10 in Vogelsong's 19 starts overall. Vogelsong's best year was in 2010, when he went 13-7 with a 2.71 ERA. That was his breakout year. The Giants as a team had the 24th worst ERA in 2013, with a 4.37 mark. Re-signing Vogelsong may come at a slight risk, but he could definitely could be good for them. With hitters having a .320 BABIP against him, Vogelsong may have just had an unlucky year. It's possible that he could comeback with a strong 2014 campaign. Miguel Cabrera wants to move back to first base. According to Buster Olney of ESPN, Cabrera informed the Detroit Tigers that he wants to move to first. 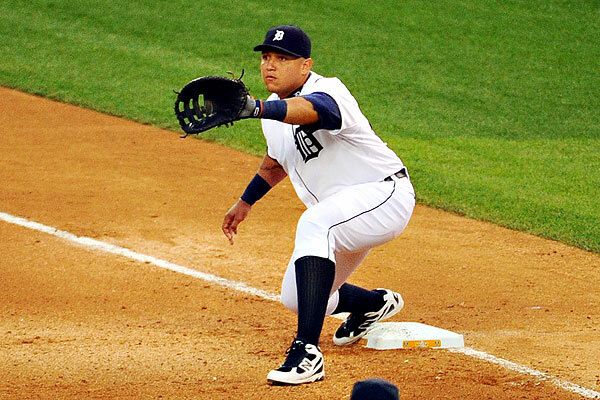 Cabrera gets his chance due to the trade of Prince Fielder, the original cause of Cabrera moving to third base. This move makes sense on many levels; it allows Cabrera to take less stress on his body (letting him play longer), opens up the door for 2010 first round pick Nick Castellanos to play third, and makes the Tigers more defensive sound. Cabrera, 31 in April, has a career .992 fielding percentage at first base. That is much better than the .956 mark he has playing third over his career. If you put that in perspective to MLB average fielding percentage, Miguel Cabrera is a mediocre fielder. At first, the MLB average fielding percentage is .994, compared to Cabrera's .992. At third, however, the MLB average is .955, again showing that Miguel Cabrera is an average fielder at third. That tells us that this move is not necessarily helping the Tigers defense by itself, but it will likely be able to keep Cabrera healthy and make other moves to make the Tigers defense better. The New York Yankees have re-signed shortstop Brendan Ryan, according to Ken Rosenthal of Fox Sports. The deal is a two-year deal, worth around $5 million. The deal also includes a mutual option for 2016. Ryan, mostly known for his defense, hit .197/.255/.273 with 4 home runs and 22 RBI. With a BABIP of .243 in 2013, there is a chance that Ryan's offense improves in the next few years. Expect him to be insurance for current shortstop Derek Jeter. If Jeter is unable to go, expect Ryan to fill in nicely. He played in 17 games with the Yankees last year.